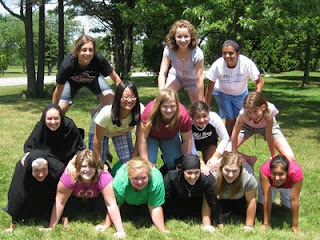 We hosted the 3rd Annual Life in Christ Girls’ Sleepover weekend July 14-17th and it was another great success! Our theme was 'Young and Faithful,' which was artfully woven into all the activities by the guidance of the Holy Spirit (and some grunt work by Sr. Julie and Jessie). Enjoying a meal together by the pond. The girls were welcomed to the weekend into our new ‘lodge’ out back, the name given to the large tent, since we were finally able to camp out this year. We began with a talk from Lauren Walter, a good friend of Sr. Julie and Jessie, who spoke of the power we have as young people to inspire and the beauty of the gift of our Catholic faith we have received, which we must remain faithful to as we grow. 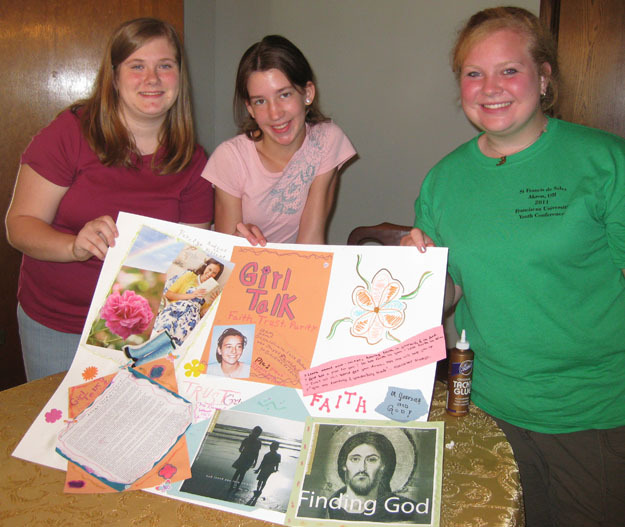 Lauren’s talk was followed by a viewing of the movie A Walk to Remember, and afterward we discussed the importance that one person can have on the world just by remaining faithful to God. Friday started off with a scavenger hunt to find the “10 Ways You Will Shock the World” with your faithfulness. The girls scoured the grounds of the monastery to locate all the clues, which proved to be tough! We REVEALED that the 10 ways to faithfulness are rooted in LOVE, which we looked at in 1 Corinthians, Chapter 13. Sister Celeste gave a talk on Prayer, Fasting and Almsgiving, which led into a service project in which the girls wrote letters to elderly nuns in the area, thanking them for their many years of service. 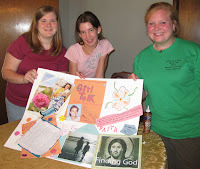 We introduced and worked on a magazine cover project, in which the girls had to come up with a title, logo and articles for a magazine which would encourage other teens to stay 'Young and Faithful.' 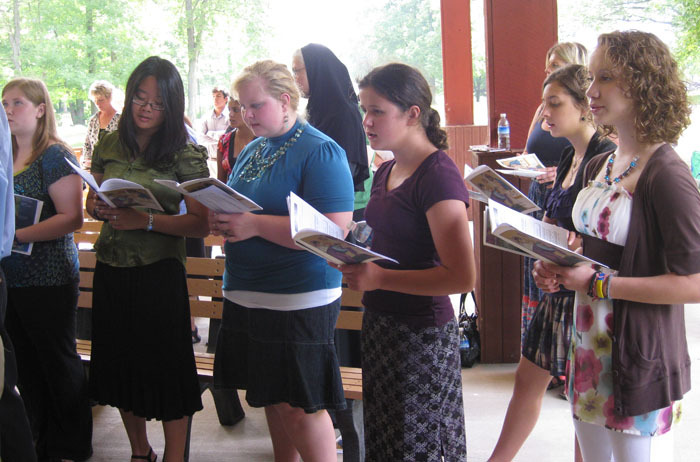 We heard a vocations talk from Jessie, on her journey through high school, college and to the monastery. We were blessed to hear a wonderful talk from Jon and Julie Hauserman about the wonderful vocation of marriage, followed by a great bonfire by the pond. Saturday we heard a talk from Ishani Peteya, one of our young adult facilitators, about her personal experiences in her faith journey. We also heard from Jessie about the Samaritan woman by the well and the need to be overflowing with Jesus – just like a sponge in a bucket overflows with water! Saturday evening, we had a prayerful evening in the Shrine Chapel across the street with a great reflection by Sr. Julie on the Jesus Prayer and an opportunity to participate in the Mystery of Repentance. Divine Liturgy at The Shrine of Our Lady of Mariapoch. 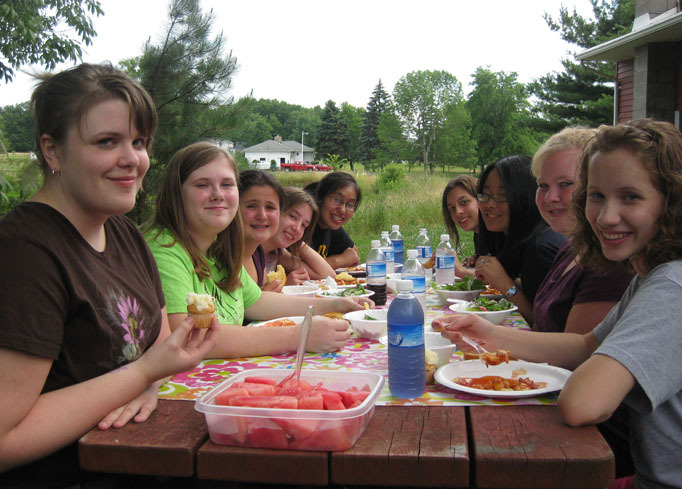 We finished the weekend with a grace-filled hierarchical Divine Liturgy with Bishop John Kudrick, a nice lunch cooked by Mr. Richard Plishka and served by the boys’ camp participants, and an awards ceremony. We were so thankful for the opportunity to spend the weekend with such beautiful young women and we look forward to seeing where the Holy Spirit leads us next year! A special thanks to the following people who made this weekend possible: Cathy McArdle, Rosalie Mendez, Ishani Peteya, Katherine Szczepanek, Fr. Dennis Hrubiak, Fr. Rich Plishka and Bishop John Kudrick. On the feast of St. Elias (Elijah), July 20, it is customary to bless vehicles, in remembrance of St. Elias' ascent into heaven in a fiery chariot. After blessing the vehicles present in the monastery's driveway after the Divine Liturgy, the backhoe that was doing some work in the ditch drove by. After shouts of, "Father! Bless the backhoe!" Fr. 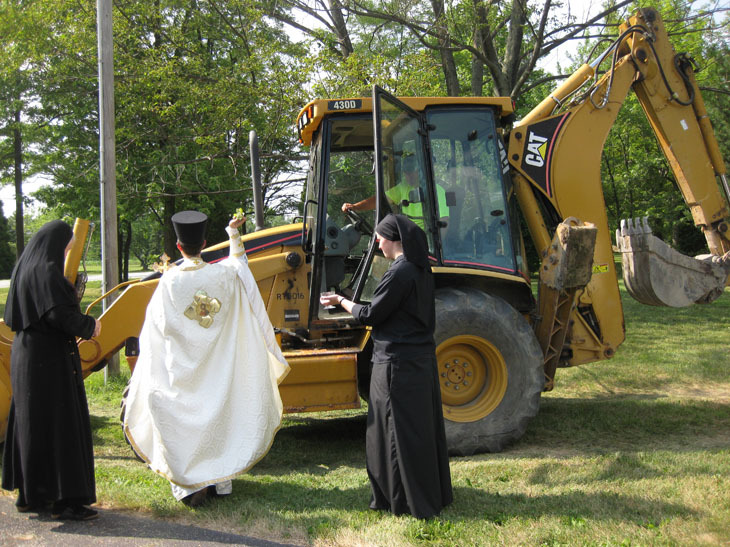 Rich gave the large vehicle a nice St. Elias day blessing. We apologize for our lack of posting! It has been a crazy summer! But we promise to post soon about some of our summer happenings. God bless you!